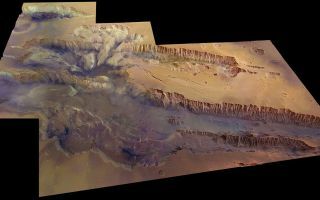 Valles Marineris, seen at an angle of 45 degrees to the surface in near-true colour and with four times vertical exaggeration. Valles Marineris, seen at an angle of 45 degrees to the surface in near-true colour and with four times vertical exaggeration in this space wallpaper. The image covers an area of 630 000 sq km with a ground resolution of 100 m per pixel. The digital terrain model was created from 20 individual HRSC orbits, and the colour data were generated from 12 orbit swaths. The largest portion of the canyon, which spans right across the image, is known as Melas Chasma. Candor Chasma is the connecting trough immediately to the north, with the small trough Ophir Chasma beyond. Hebes Chasma can be seen in the far top left of the image. This image was taken Sept. 2, 2008.